1 THEREISASOLUTION (Pages 17 through 29) As we study Chapter 2, THERE IS A SOLUTION, we will learn what the Solution is to that seemingly hopeless state of mind and body. We will learn who gave us this information. We will learn where we will find the clear-cut directions for taking the actions we must take to be assured that we will join the first one hundred as recovered alcoholics. We will learn the difference between the Fellowship and the Program. We will learn that, although we share a common problem, that, in itself, will not produce the Solution. We will learn some very real truths about alcoholism. We will learn that, although an alcoholic cannot control the amount he drinks once he has taken the first few drinks (because of the physical sensitivity to alcohol), that is not the real problem. The physical allergy is not what drives us to Alcoholics Anonymous for help. The real problem centers in the mind; because the real alcoholic is unable to manage his most earnest decision to never take another drink. But drinking is not the main problem of the chronic alcoholic. Alcoholics drink -- and do so better than almost everybody else. Stopping is not the problem. Every alcoholic has stopped many times. The real problem of the chronic alcoholic is that we cannot stay stopped. The real alcoholic mind is one that does not have sufficient willpower to manage the decision to stay stopped; that produces the insidious insanity that leads to the first drink. Lacking willpower to manage a decision to not take the first drink mandates that the hopeless alcoholic find a Higher Power that will remove the need to try to manage a decision to never drink again. We will also learn something of the three types of drinkers. There are the moderate drinkers who would never think about coming to Alcoholics Anonymous; they can take it or leave it alone. Then, there are the hard drinkers; they may need to come to Alcoholics Anonymous to learn that they are not alcoholics. Given a good reason, they can drink like moderate drinkers or abstain completely, if they so choose. 2 THEREISASOLUTION But the real or chronic alcoholic is totally powerless over alcohol. We can neither control the amount we drink, nor do we have the power to manage a decision to not ever drink again. 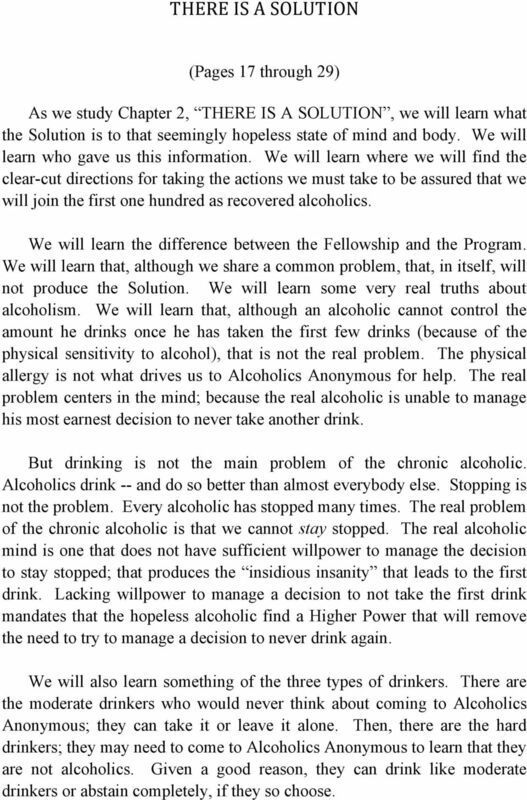 Alcoholics Anonymous is for the real alcoholic only. We will learn more about that when we study the Twelve Traditions of Alcoholics Anonymous. So, is there a Solution? Let s find out. 3 THEREISASOLUTION (Page 17) (P) 1. What do we know? 2. What have they done? 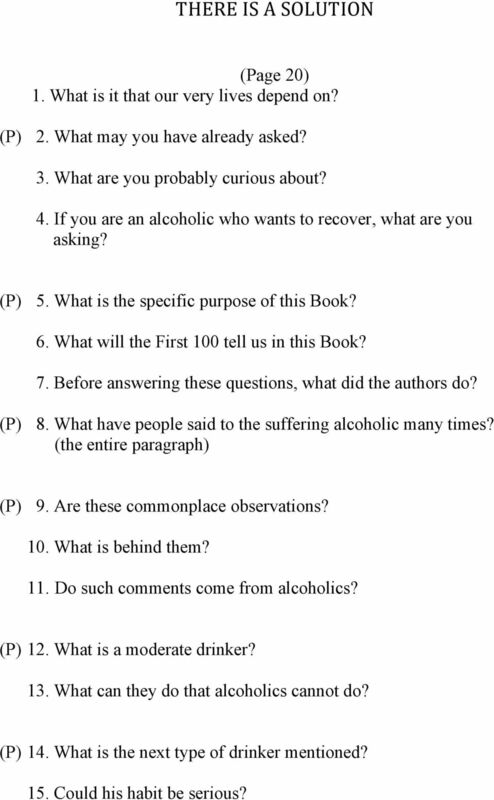 (2 sentences) (P) 3. Who are we, members of Alcoholics Anonymous? (2 sentences) 4. Without A.A., would we have known each other? 5. What do recovered alcoholics share? 6. Who are we like? 7. How are we unlike them? 8. What feeling have we shared? 9. Will the common problem keep us together? (P) 10. What tremendous fact does keep us together? 11-a. On what can we absolutely agree? 11-b. We can join in what? 13. Where do we find this most important information? 4 THEREISASOLUTION (Page 18) (P) 1. Is the effect of our illness limited to just the alcoholic? 2. What are our feelings for a cancer patient? 3. What goes with alcoholic illness? 4. Who does it affect? 5. 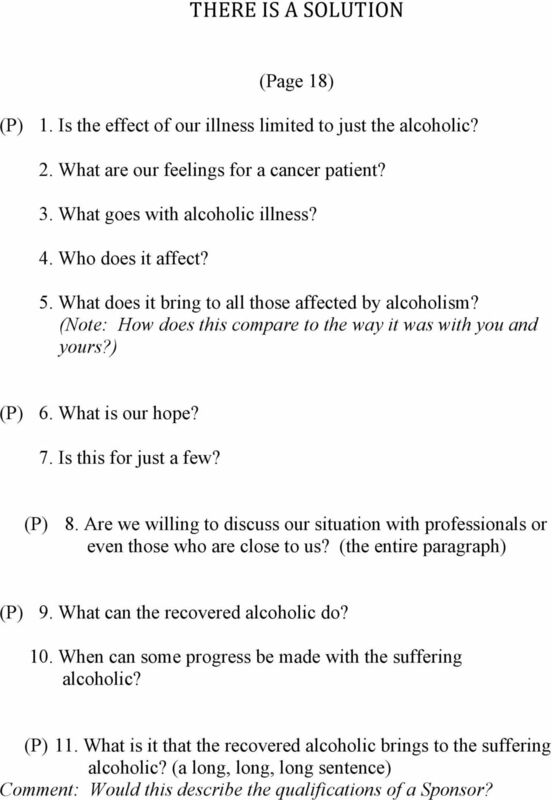 What does it bring to all those affected by alcoholism? (Note: How does this compare to the way it was with you and yours?) (P) 6. What is our hope? 7. Is this for just a few? (P) 8. Are we willing to discuss our situation with professionals or even those who are close to us? (the entire paragraph) (P) 9. What can the recovered alcoholic do? 10. When can some progress be made with the suffering alcoholic? (P) 11. What is it that the recovered alcoholic brings to the suffering alcoholic? (a long, long, long sentence) Comment: Would this describe the qualifications of a Sponsor? 5 THEREISASOLUTION (Page 19) 1. What happens after the recovered alcoholic tells his story to the suffering alcoholic? (P) 2. How many of us earn our living 12th Stepping alcoholics? 3. What is the elimination of drinking? 4. What is much more important than just not drinking? 5. How many of the authors worked with suffering alcoholics? 6. What are some of us fortunate enough to do? (P) 7. Will AA bring an end to the ravages of alcoholism? 8. With what are we overcome if we live in large cities like Dallas? 9. Many alcoholics could recover if what? 10. What question faced the First 100? (P) 11. To what conclusion did the First 100 arrive as an answer to that question? 12. What is the content of the Big Book? 13. Who could benefit from this accumulated experience and knowledge? (P) 14. What will it be necessary to discuss? 15. The authors were aware of what? 16. What would really please the authors? 17. What did the authors of this Book try to achieve? QUESTION: Were they successful in their attempt to avoid contention? ANSWER: The answer to this question is demonstrated by the wide acceptance of our Program. 18. What do most of us sense? 6 THEREISASOLUTION (Page 20) 1. What is it that our very lives depend on? (P) 2. What may you have already asked? 3. What are you probably curious about? 4. If you are an alcoholic who wants to recover, what are you asking? (P) 5. What is the specific purpose of this Book? 6. What will the First 100 tell us in this Book? 7. Before answering these questions, what did the authors do? (P) 8. What have people said to the suffering alcoholic many times? (the entire paragraph) (P) 9. Are these commonplace observations? 10. What is behind them? 11. Do such comments come from alcoholics? (P) 12. What is a moderate drinker? 13. What can they do that alcoholics cannot do? (P) 14. What is the next type of drinker mentioned? 15. Could his habit be serious? Copyright 1980 Alcoholics Anonymous World Services, Inc. Mail address: Box 459 Grand Central Station New York, NY 10163. www.aa. Step 1 "WE ADMITTED WE WERE POWERLESS OVER ALCOHOL AND THAT OUR LIVES HAD BECOME UNMANAGEABLE." STEP ONE: We admitted we were powerless over cocaine and all other mind-altering substances that our lives had become unmanageable. Have you or a loved one been in treatment before and found that it did not work? For Anyone New Coming to A.A. For Anyone Referring People to A.A.
A Suggested Format for Conducting an A.A. Meeting 1. Good Evening ladies and gentlemen. This is the regular meeting of the group of Alcoholics Anonymous. My name is and I am an alcoholic and your Secretary. A Sample Radio Interview By Erik R, 7/5/00 The following is a sample interview that has been put together to help show how to provide a positive approach to answering questions about Narcotics Anonymous. Buffalo Intergroup Treatment Commitments Practical experience shows that nothing will so much insure immunity from drinking as intensive work with other alcoholics. It works when other activities fail. Before You Take That Bite Before you take that bite, read this pamphlet and remember today you have a choice. Food Addicts in Recovery Anonymous (FA) offers a solution for all forms of food addiction. FASTFORWARD #3461 OPEN-CAPTIONED AIMSMULTIMEDIA 1995 GradeLevels: 7-12 32minutes DESCRIPTION Alex has a bright future as a top athlete and has plans for college. Unfortunately, he also likes to drink beer. FOOD ADDICTS PHONE MEETING FORMAT (Rvsd January 2013) Leader/Coordinator copy IMPORTANT PLEASE READ NOTES AT END OF FORMAT BEFORE LEADING THE MEETING. This is NA Fellowship-approved literature. Copyright 1976, 1988 by Narcotics Anonymous World Services, Inc. All rights reserved. Relapse and Recovery: A crash course on the basics of addiction. The Universal 12 Steps of AA for Atheists & Freethinkers by Dennis J. Fitzpatrick Freethought holds that individuals should not accept ideas proposed as truth without recourse to knowledge and reason. Standard recovery models have been adapted to meet the needs of people with disabilities, but more work must be done. Alcoholism and Drug Abuse in China By David J. Powell, Ph.D. President, International Center for Health Concerns, Inc.